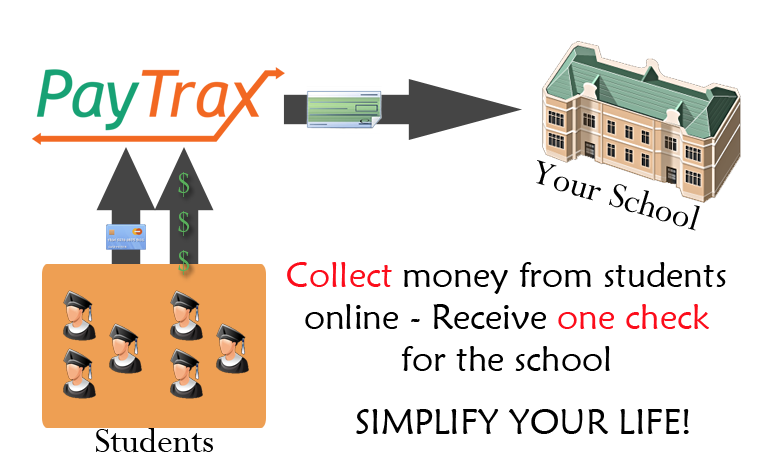 PayTrax is a service to take the burden of managing and collecting money for your school, church, or organization. Not only can you now accept credit card payments from your students, but you can let PayTrax purchase your tickets, register you and your students for an event, or purchase individual items. PayTrax was designed with simplicity in mind. Once your account is ready, you can instantly create collections and send out links for your students to register. When they register, they will have the option of paying via credit card or manually bringing their payment in to you and manually entering it. At the end of the collection you can have a check will all the money collected via credit card mailed to you and the money aspect of your trip or activity is finished! Alternatively, we will register you for any events, purchase any tickets, or setup any other aspect of your trip or activity and send you the money difference. No more problems with making sure a student is paid in full or not - PayTrax tracks how much money your students owe and make it as easy as a few clicks to notify them of how much they owe. Allow PayTrax to purchase and ship your tickets, event registration, or any other item that your trip or even needs. schollPayment's rates are extremely low and are priced to make our service's benfits outweight its costs. Want a check every week? Everyday? Everytime $100 if collected? No problem. PayTrax works to fit your needs, not ours. Collect as much or as little information about your students as you want, and then print out one sheet with all the information saved.